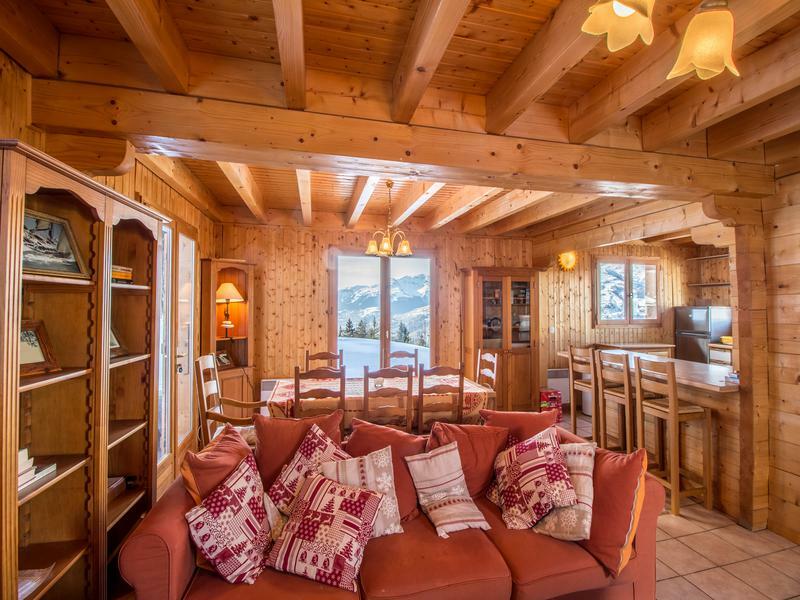 The chalet with spacious surroundings and great views with a short walk to the pistes of Les Arcs 1800. 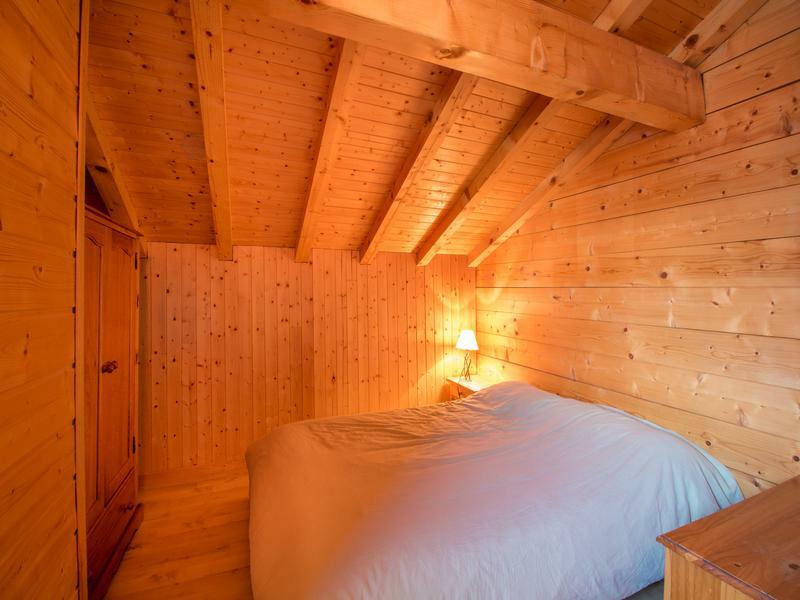 The chalet has 3 floors, 4 double bedrooms, one with en-suite, wood fire, large terrace, and a separate garage. Ground Floor... Entrance hall with staircase, storage and WC with opening into open plan living / dining room and kitchen. The living room has a wood burning fireplace and door onto the garden. The dining room with french windows onto the patio / garden and kitchen with great view of the valley and the Mont Blanc. The kitchen has a double sink, hob, oven, extractor and fridge freezer. First Floor... You will find 3 double bedrooms, 2 of which share a balcony, and a shared bathroom with toilet. Lower Ground... The stairs lead into an open large room with storage that could be used as an office / games room, with a door to the master bedroom. 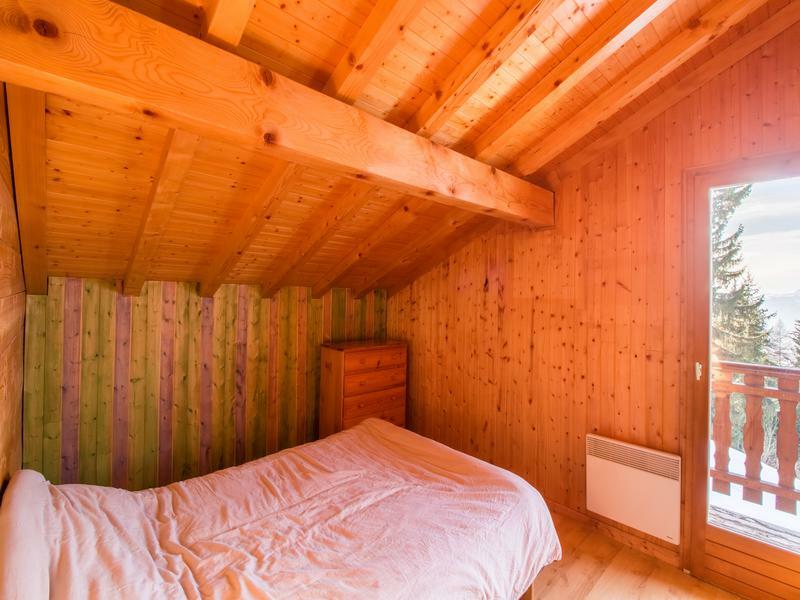 The bedroom has french doors leading to a small terrace, and has it's own en-suite with Jacuzzi bath, shower, toilet, bidet and sink. 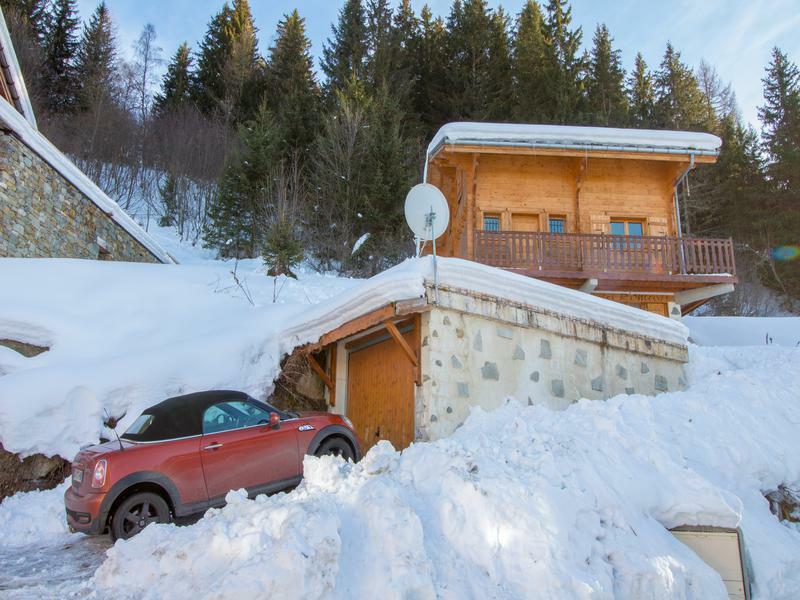 Outside... Good space to either side of the chalet would allow you to extend if needed. 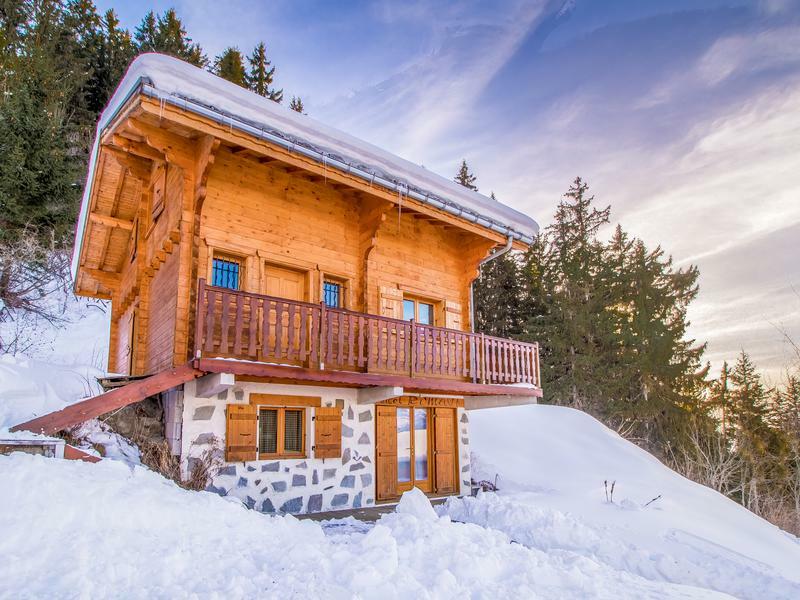 The chalet has a wrap around balcony / terrace at ground level, and a private terrace on the lower ground. At the roadside level you have a garage with an additional parking place. The Resort... Arcs 1800 offers a great selection of bars and restaurants along with all the usual ski shops and services, with some of the best skiing around, sledge runs, paragliding, including the new leisure centre Mille8 with pool and saunas. In the summer Les Arcs 1800 has its own 27 hole golf course, as well as great mountain biking and road cycling, not to mention the miles of hiking in the national parks surrounding the area. 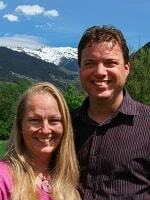 Italy is less than an hour away via the col de Petit Saint Bernard open throughout the summer. The Ski Domain... Paradiski is the 2nd largest linked skiable domain in the world with: - 425km of pistes over 14390 hectares - 232 pistes for all levels - 263 hectares of man-made snow, 818 snow machines - 2 equipped glaciers at more than 3000m high - 70% of the skiable domain over 2000m - 3 resorts: Les Arcs, Peisey-Vallandry and La Plagne Travel... Chambery is the nearest international airport and is only just over an hour away, Geneva, Lyon and Grenoble are all 2 hours away. 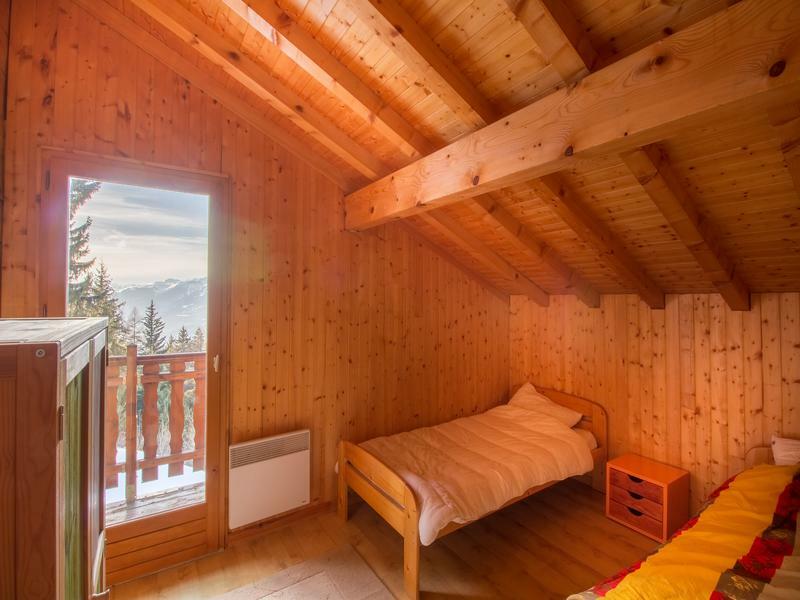 The nearest train station is Bourg-Saint-Maurice with direct Eurostar connections during the ski season and connecting Funicular directly into the Les Arcs resort. It takes about 10 hours to drive from Calais and the other ferry ports in the north of France. Paradiski is the name of the joint La Plagne, Les Arcs, ski area linked together by the Vanoise Express cable car. Opened in December 2003,the Vanoise Express is currently the world’s largest single span cable car; in fact there are two of them both capable of ferrying 200 people across the Ponthurin valley that divides the two areas. The journey and the views make for a spectacular 4-minute ride. In total Paradiski offers a HUGE 425 km of piste. Individually, La Plagne (225 km) and Les Arcs (200km) are significant ski areas in their own right and are both made up of different villages. In La Plagne the high altitude villages are Aime 2000,Plagne Centre, Belle Plagne, Plagne Bellecote, Plagne Soleil, Plagne Villages and Plagne 1800. 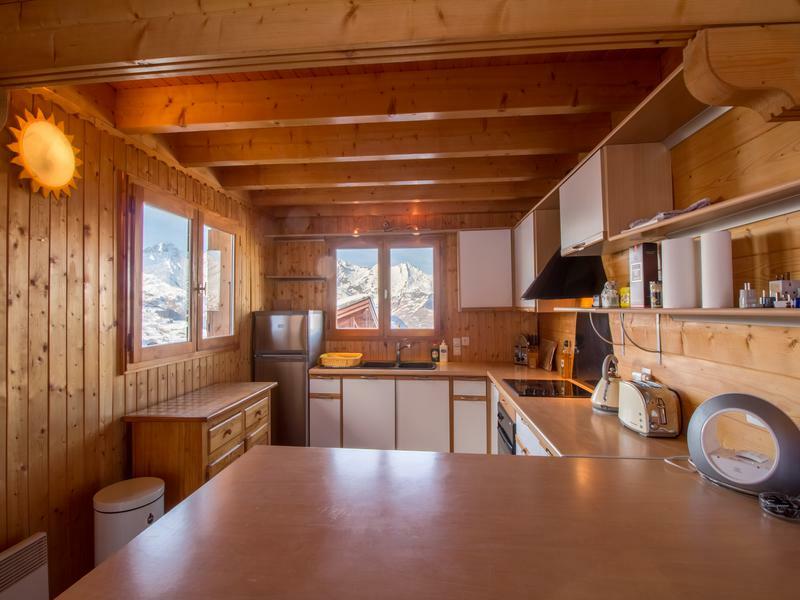 These are all situated between 1800m and 2100m and offer snowsure high altitude ski in ski out convenience. 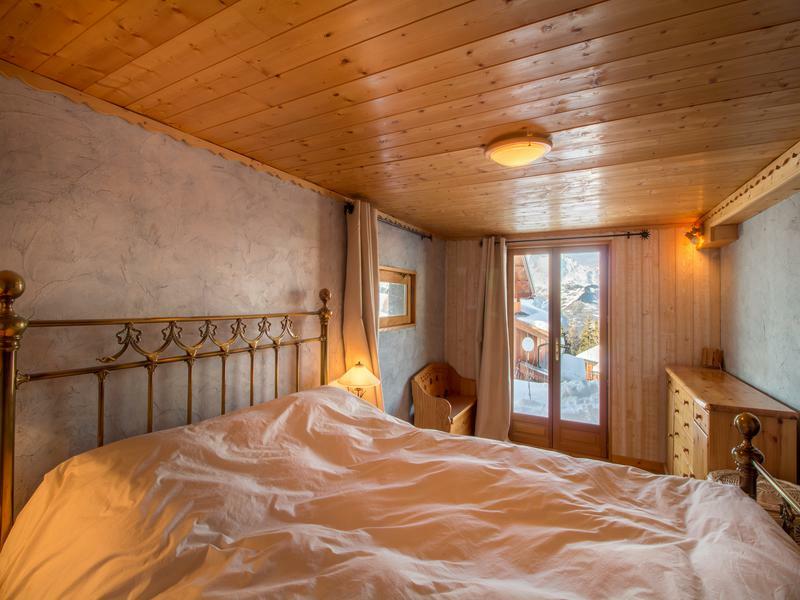 Lower down the delightful villages of Montchavin, Les Coches, Montalbert and Champagny en Vanoise all offer the charm and cosy comfort of village life, with their own tree lined local slopes and easy access to the high altitude slopes of La Plagne. In Les Arcs the high altitude villages are Arcs 1600, Arcs 1800, Arcs 2000 and, the latest development, Arcs 1950. Again these all offer a ski in ski out experience. Great cruising runs through the trees lead to the lower villages of Plan Peisey, Vallandry and Villaroger for a more traditional mountain experience. Both La Plagne and Les Arcs offer something for everyone. Early intermediate blue and red run skiers can soon explore the area and travel around the mountain enjoying some of the good value mountain restaurants. However with two glaciers at over 3,000m, a wealth of “between the piste” and off piste and long runs through the trees, there really is something for all levels of skier---and let’s not forget you boarders out there—both resorts offer a choice of snowparks with jumps, rails and the ,all important, music. La Plagne, Les Arcs, Paradiski—one of the world’s great ski areas. Les Arcs has always been popular with the French and increasingly British clients are enjoying its wide variety of pistes (some 200km. ), easily accessed off-piste, mainly traffic free villages and, of course, the amazing Vanoise express cable car link to La Plagne; together the two resorts are known as PARADISKI and offer some 425km of piste. Les Arcs is made up of four modern resort villages at high altitude with more traditional villages lower down Arc 1600 was the original Arc and is linked to the valley town of Bourg St. Maurice by funicular railway. It is a small-scale village with a friendly, very French, atmosphere. The largest and liveliest village is Arc 1800 itself now subdivided into three sections, Charvet, Villards and Charmettoger. Arc 1800 offers fast access to the high altitude slopes including the Transarc gondola up to the Col du Chal from where you can ski down to Arc2000 and Arc 1950. 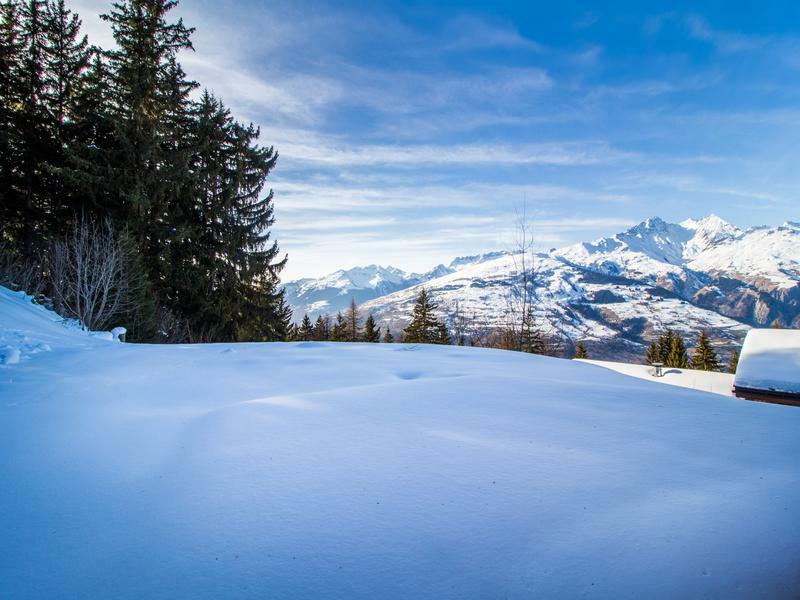 Arc 2000 is a modern development that ,as the name suggests, is ideally located for some of Les Arcs’ highest and toughest skiing. Arc 1950 is the latest village to be developed. Canadian developers Intrawest have built this in a traditional style offering accommodation standards that are much higher than is usual in French resorts. 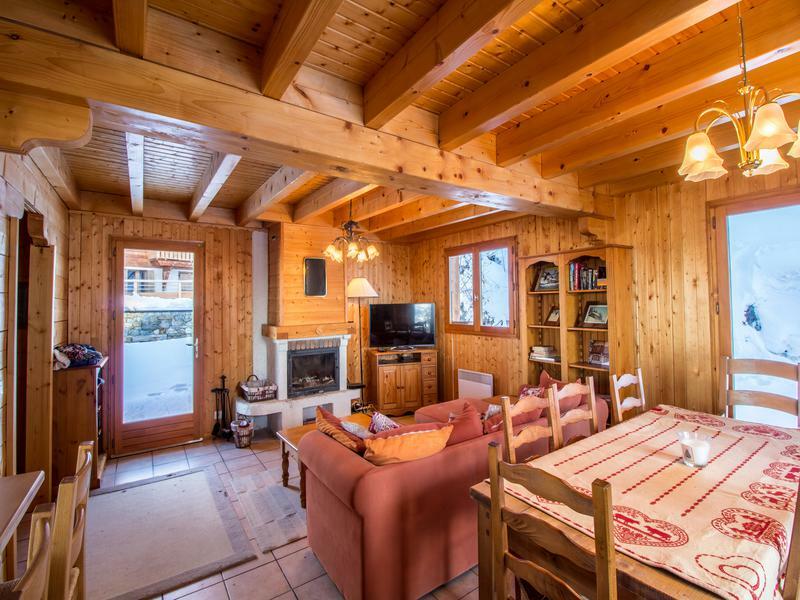 It has proved a popular development and offers a good choice of accommodation, restaurants and bars and easy access to the slopes. Lower down the mountain there are more traditional villages, which provide a good base for mixed ability groups and families. Plan Peisey and Vallandry are right next-door to each other at an altitude of 1600m. They now find themselves at the heart of Paradiski as the Vanoise Express link to La Plagne operates out of Plan-Peisey. Upgrades to the lifts and installation of several new chairlifts have improved access to the higher altitude slopes. Villaroger (1200m) on the other side of the mountain is a quiet, rustic village with chairlift links up to Arc 2000.